Battle Camp is about imposing your will on your opponent. Outworking your competition, channeling your Best Effort on a daily basis. Realizing that if you put in the Effort... you will reap the Reward. Whether you are trying to protect the puck, clear your zone, vying for position, beating your opponent to a loose puck hockey is a game comprised of individual and group battles. This Camp is Specifically designed with Player Safety in mind. 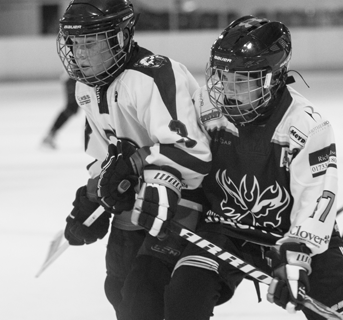 Our battle camps focus on further developing a players compete level and refines their skills. Content includes small area skills, puck protection, controlled contact, 1 on 1 and 2 on 1. Players will be grouped according to size and ability. Parents have been asking for this program for sometime this is your opportunity to join us this August. Disclaimer: We the applicant and his/her parents or guardians agree that RPM Hockey Company Ltd. it’s owners, directors and instructors along with the ice arena, recreational facility and it’s employees are not liable for nor held responsible for any incident or loss however caused and agree to release same from all claims or damages. We further agree that the applicant has no medical problems and is in good physical health and that we will be responsible for all medical and dental claims and/or insurance. RPM Hockey Company Ltd.Reserves the right to use any photos taken during the programs for advertising and/or instructional purposes. Players are expected to conduct themselves in an appropriate manner at all times. Failure to do so could result in removal from our programs.